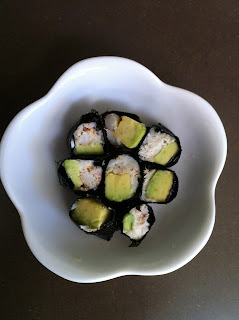 california roll | what is clara eating today? cut avocado into 4 long strips. in a small bowl, mix the crab meat with mayonnaise. lay out nori, short side in front of you. lay out avocado and 1/4 of crab mixture. roll up nori. you can use a little bit of mayo to close up the nori. cut them into 4-5 pieces.repeat for all three remaining sheets.